Home foreclosure rates past and present. There is a LOT of talk right now about high home foreclosure rates. From how bad some people make it sound, it seems as if every other home owner in the country right now must be currently in foreclosure. Currently the foreclosure rate is around 2.8%. That is a historical high. How high is that really compared to previous decades? This FDIC report from 1998 has data on foreclosure rates from previous decades. That document has foreclosure rates listed for 1950 to 1997 in the appendix. If you look at the period from 1970 to 1998 you can see that the foreclosure rates had gradually increased over those 3 decades. The FDIC article also has some interesting discussion on the why foreclosure rates have increased gradually over the years. Interestingly they don't find a strong correlation between unemployment rates or interest rates and the foreclosure rate. So in other words the foreclosure rate didn't seem to go up directly in relation to high unemployment or high interest. Another document from the Federal Reserve in St. Louis looks back at the foreclosure rates around the great depression. You might look at this data and conclude that the problem right now is worse than the great depression. But the report points out that the delinquency rate on mortgages in the 1930's was much much higher than it is now: "Thus, at the beginning of 1934, approximately one-half of urban houses with an outstanding mortgage were in default (Bridewell, 1938, p. 172). For comparison, in the fourth quarter of 2007, 3.6 percent of all U.S. residential mortgages and 20.4 percent of adjustable-rate subprime mortgages had been delinquent for at least 90 days." So back in the great depression nearly half the people were behind on their mortgage. Today only around 4% of people are delinquent. Another interesting report on recent foreclosure rates is from the Clevelend Fed. They show the foreclosure and delinquency rates for both prime mortgages and subprime mortgages. Their data is very revealing about how the current problem is almost entirely with the subprime mortgages. 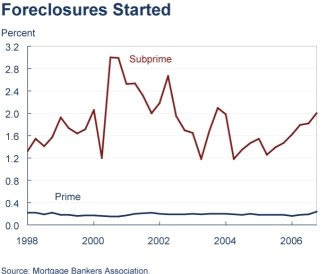 Looking at that chart we can see that prime mortgage rates foreclosure rates have been pretty flat for the past decade. Its really the subprime mortgages foreclosure rates that have been high. Is a prepaid legal service a good idea? How to value rental property prices. Who makes up the top 5% of wage earners? ?